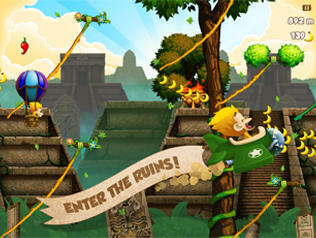 Benji Bananas Adventures is out now for iPhones and iPads! 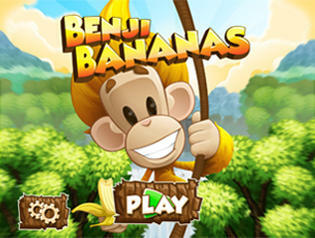 Join more than 100 million Benji fans who already rave about how much fun Benji Bananas is. To the fans of the original Benji Bananas game, Benji Bananas Adventures offers a familiar game mechanic, but a vastly different experience with over 100 new levels. 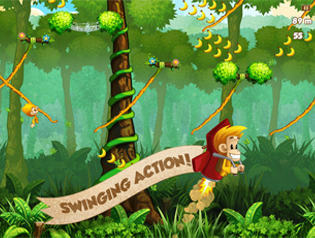 Benji Bananas: Exciting and fun physics based adventure game! The best game on your phone! And it's free! Fly from vine to vine, but watch out for dangers lurking in the jungle. Earn bananas to get upgrades, specials and power ups. Visit our Benji Bananas Facebook page. You should also follow us on Twitter. Reviews of Benji Bananas on the web! Developed by Tribeflame. Published by Fingersoft.